Outside of many buildings and often the rooftops of buildings in Okinawa, you will see creatures that look like a cross between a lion and dog. They are called shisa. They are usually found in pairs, one with its mouth open and one with its mouth closed. I've been told that the one with the open mouth keeps away evil spirits and the close mouth one keeps the good spirits around - or maybe it's the other way around. Anyhow, you can find a bit more information about shisa here. Also, this site has some very interesting information about them including pictures of some more contemporary shisa. 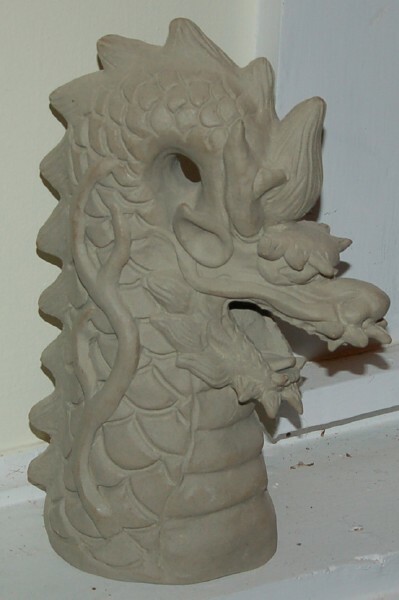 Based on this site and this site, I'm thinking the dragon heads are inspired from the dragon pillars at Shuri Castle. Unfortunately, I never did make it to Shuri Castle, so I did not see the dragon pillars first-hand. The three weeks I was in Okinawa went by way too fast and there were many places I would have liked to have visited that I never got to. Hopefully I'll have the chance to go to Okinawa again. 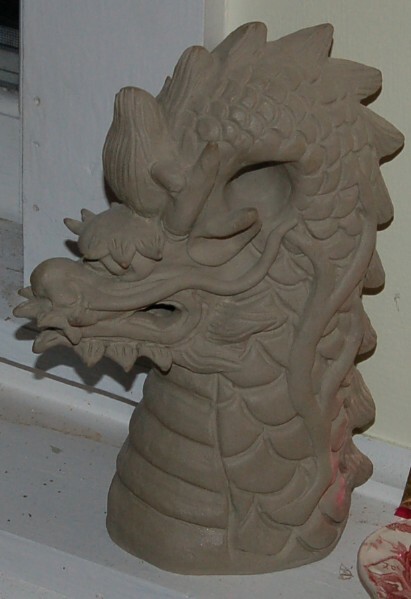 It should be noted that the dragon heads I bought aren't as large as the several foot high ones found outside of buildings. These are only 9 inches tall. It was an interesting experience buying items in Okinawa. If you make a large purchase in any of the small shops, it is not uncommon for the shop-keeper to go into the back room and come out with a tray with tea and some sort of treats - either cookies or sweets for you to enjoy while waiting for your item to be wrapped. All the shop keepers in Okinawa take great care in how they wrap items that are sold. Even if you buy the smallest of trinkets, the shop-keeper will wrap it up like it was a treasured possession and then carefully put it in a bag and tape the bag shut. Even at the grocery store the normal plastic shopping bags have extra plastic tabs on the middle edge that allows the bag to be tied shut while still allowing the plastic carrying handles to be used. And all the cashiers make sure to tie each bag of groceries shut before handing them to you. The cultural details like the wrapping of purchases are so interesting. Seems so silly that they place such importance on little things, and then you start wondering what importance we place on different things. . .